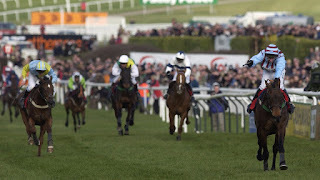 The 2003 Champion Hurdle was won, in emphatic style, by Rooster Booster, owned by Terry Warner, trained by Philip Hobbs and ridden by Richard Johnson, all of whom were recording their first win in the race. The popular grey had won the Vincent O’Brien County Hurdle at the 2002 Cheltenham Festival, but improved out of all recognition – officially by 19lb – in 2002/03. His winning margin, of 11 lengths, has been bettered just twice in the history of the Champion Hurdle. Defending champion Hors La Loi III blotted his copybook by refusing to race. Native Upmanship and Cenkos find second and third, as they had in 2002, but the previous year’s winner, Flagship Uberalles, could only finish fifth of the eight finishers, beaten 20 lengths, behind the winner, Moscows Flyer. Jessica Harrington’s the 9-year-old had won the Arkle Challenge Trophy at the previous Cheltenham Festival and, notwithstanding a non-completion in the Tingle Creek at Sandown, had won all four completed starts since, so looked a worthy favourite. Aided by the fall of Latalomne, who was going well, at the second last fence for the second year running, Moscow Flyer soon had the race sewn up, winning by 7 lengths. Defending champion, Baracouda, who’d been turned over at 4/11 on his previous start in the Long Walk Hurdle at Ascot, where jockey Thierry Doumen overdid the waiting tactics, once again started favourite at 9/4. The 8-year-old had to work a little harder than the previous year, but nevertheless collected, staying on gamely up the hill to deny the 6-year-old Iris’s Gift, trained by Jonjo O’Neill and ridden by Barry Geraghty. A.P. McCoy famously said in the build-up to the 2003 Cheltenham Gold Cup, “I don't know what I’m riding this year and I don’t think it matters. Best Mate will win.” The multiple champion jockey was, of course, correct in his assertion; backed into 13/8 favourite, defending champion Best Mate came clear with two to jump and won easily by lengths. In so doing, he became the first horse since L’Escargot, in 1971, to win the Cheltenham Gold Cup twice. 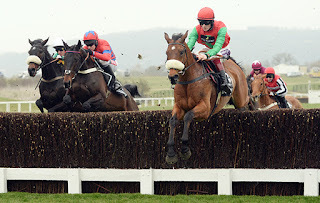 The Queen Mother Champion Chase admits horses of age five and above competing over a distance of 3219 meters (2 miles). The race is ranked grade 1 among Great Britain’s National Hunt Steeplechase races. It is one of the classic races that take place on the Old Course. Chase. It existed under that name for 21 years until it adopted the current name in 1980 as part of Elizabeth the Queen Mother’s 80th birthday celebration. The Queen Mother herself was a fan of the race and did actually put competitors in it. Game Spirit was her most successful horse, taking a second place finish in 1976. The race operated under its pure name for 27 years from 1980 as it did not have a sponsor. Since 2007, it has taken the existing sponsors name as a prefix. As of the 2017 festival, Betway were the race sponsors and are expected to carry the deal into the 2018 event. regarded the National Hunt’s biggest minimum-distance competition, this race attracts a lot of onlookers- some for the fun of it and others looking to see out their bets. No matter the drive, race fans always have a reason to hold their breaths. The race has been won by ten-year-old horses over the last two years -Sprinter Sacre in 2016 and Special Tiara in 2017. Before then, it was a decade since a horse older than nine years won the race.